The Daily Chow: UFC Fight Night 21 - Gomi vs Florian TONIGHT! 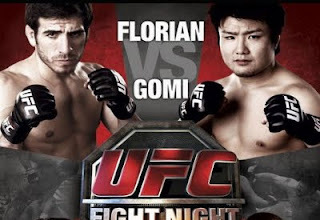 UFC Fight Night 21 - Gomi vs Florian TONIGHT! For most main stream MMA or strictly UFC fans tonight's fight may come off like another free card, but for the well versed MMA fans, tonight will be about the UFC debut of Takanori Gomi. Most people see Gomi as a new comer in the sport; however Gomi has had an illustrious 12-year career in Japan. His extensive career included being a successful submission wrestler, Shooto champion, PRIDE lightweight champion, and PRIDE grand prix champion. He currently holds a record of 31-5, but in the past 4 fights only has a 2-2 record, hardly amazing by anyone's standards. What happened during his recent bouts? "I'm lazy," Gomi admitted with a laugh. "It was hard to stay motivated for fighting for so many years. I knew I should have trained more before the fights. But when I go to the ring now, I want to show an explosive fight." Lightweight contender Kenny Florian will welcome Gomi to the cage tonight and hopefully deliver what will be an impressive fight night. Since his loss to BJ Penn at UFC 101, Florian stated that he'd train even harder and he came back submitting Clay Guida in a rear naked choke for 107. Gomi not diving into too many details about Kenny Florian simply expressed that he believes the UFC is loaded with powerful lightweights. Two sporting events in one week, believe me I could use it with how insanely life has been (which is a not just a good thing but a HOORAH great thing). Have a great fight night folks!